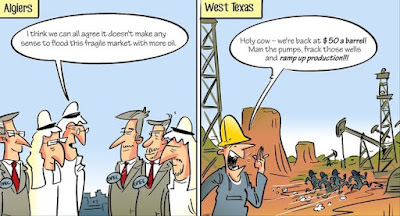 We've long noted that everyone, from Saudi Arabia to the Green Party, misunderstands the logic of the US onshore oil & gas industry, namely that it (a) is rational; (b) is flexible; (c) understands sunk costs; (d) has ready access to equally flexible and rational finance; and (e) is constantly innovating - in the direction of reducing costs. And thus it defies predictions every time. This cartoon says it all really. If you want some words to go with it, there's always Nick 'sometimes useless, sometimes not' Butler blogging in the FT.
[Saudi] strategy has not only failed but has caused serious damage to the Saudis themselves. Prices fell much further than anyone anticipated because other participants in the market did not respond as expected. The Saudi increase in production has not destroyed the US industry – American output has fallen only marginally despite a 70 per cent drop in prices. The kingdom simply underestimated the resilience of the US producers and their ability to cut costs. "[Saudi] strategy has not only failed but has caused serious damage to the Saudis themselves." Aberdeen is like a ghost town compared to 2012/2013. And now, with our sterling-dollar exchange rate, won't our fracking industry take off and help reduce our balance of trade deficit? I think the Saudi policy was aimed at Iran rather than at the US. For a moment I thought I'd read "The Saudia Arabia Green Party". 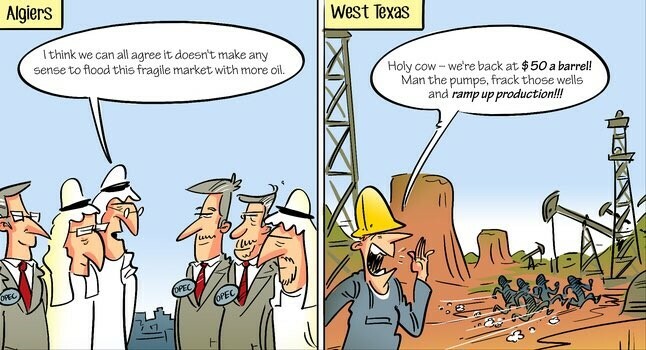 Doesn't just apply to oil though if anyone has gone up against a US company in a global market. When the internal US market is buoyant they concentrate there. When there is a drop in US demand, they dump / marginal cost. AFAIK there are severe penalties against US companies for anti-competitive behaviour - which is what they tell you are they trash your market. Hi all, excuse me, Kev please empty your spam. Emails bouncing due to full inbox? My recent email to you bounced too. I have left a message on your blog.